Slow Cooker Spaghetti Squash and Meatballs is so simple to make! 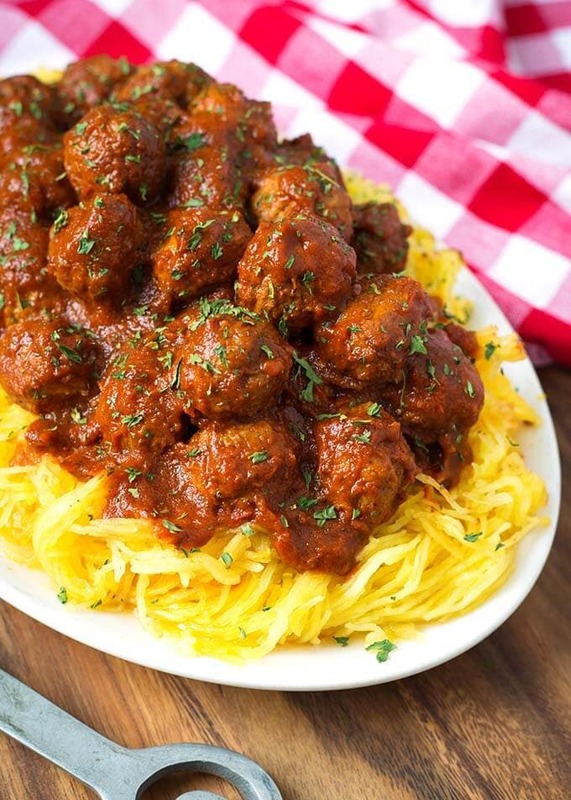 You will enjoy this easy low carb crock pot spaghetti squash and meatballs dinner! We love this recipe! I often have a bag of cooked meatballs hanging around in my freezer. They are handy to have on hand for an easy dinner. My Instant Pot Meatball Pasta Dinner recipe uses them, and is a super fast and delicious meal. I also usually have a spaghetti squash or two in my pantry. They last a long time, so if you buy one you don’t have to use it right away. Setting up the slow cooker in the morning before work can be time intensive if you have to sauté or pre-cook any of the ingredients first. You just don’t always have time to do that. 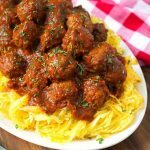 This Slow Cooker Spaghetti Squash and Meatballs recipe uses those wonderful precooked meatballs and jarred spaghetti sauce. And with only a few ingredients, that makes putting it together in the morning a cinch! Then just scrape out the flesh (the ‘spaghetti’) with a fork and either mix it in with the meatballs and sauce, or spoon the mixture over the spaghetti squash. You can easily make your own meatballs. I bake mine in the oven and they are delicious! I make both beef and turkey. Here’s my Easy Baked Meatballs recipe. I love making fresh marinara sauce in my Instant Pot®. Here my recipe for Instant Pot Marinara Fresh Tomato Sauce. This sauce is amazing with this recipe! We also like to use the Ikea Swedish Meatballs. They are smaller and one bag (2 lbs / 1000 g) with a large spaghetti squash makes a lot. They make a veggie and a chicken version, as well as the traditional beef meatballs. You will need a larger (7 or 8 qt) crock pot if you use the whole bag. Slow Cooker Spaghetti Squash and Meatballs has only 4 ingredients and is so simple to make! 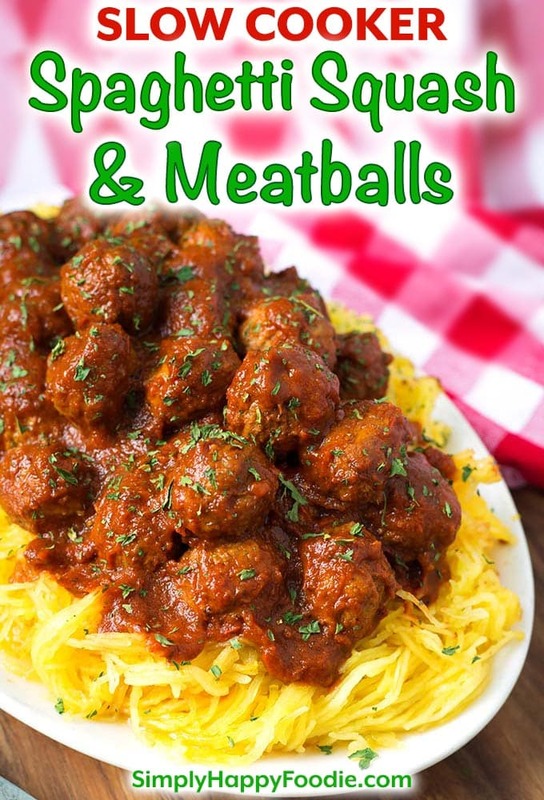 You will enjoy this easy low carb crock pot spaghetti squash and meatballs dinner! We love this recipe! 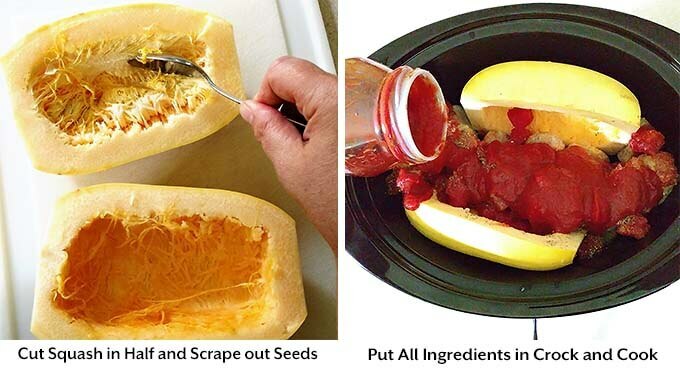 Wash the spaghetti squash and cut in half however it will best fit in your slow cooker. Remove the seeds and place in the slow cooker. Pour the diced tomatoes over the meatballs. Pour the spaghetti sauce over the meatballs/tomatoes. Press the squash into the sauce, flesh facing down (skin side up). Cook on Low for 5-6 hours, or High for 3-4 hours. You will know it is done when a knife slides easily through the squash. When done cooking, remove the squash and carefully scrape out the flesh with a fork. You may need to let it sit a few minutes after removing it so it cools a little. Discard the skin/shell. Either add the squash to the meatballs/sauce and stir, or serve a portion of squash to each person and ladle some sauce and meatballs over it. Garnish with some parmesan cheese and parsley, if desired.